Summer Camp 2016 – it’s Back! It’s a week that needs very little introduction, the Sutton & Epsom Summer Camp returns, and it’s going to be bigger and better than ever! Monday 15th – Friday 19th August 2016…it’s a Summer Camp like no other with water-fights, tournaments, BBQs and more! But of course, it’s 5 days of packed full of rugby where your child learns to play the SUTTS Way! Over 200 children were at the camp last year so don’t miss out! As a thank you for the ongoing support, the club has frozen the weeks prices for both members and non-members, making the camp cheaper than the vast majority of local sports camps! Yet again we are proud to sponsor the event. To make the booking process a lot easier, you can now register your child via Bank Transfer online. 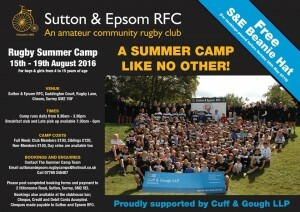 Please send all booking enquiries to Sam Phillips on suttonandepsom.rugbycamps@hotmail.co.uk or phoning 07769 345407. ** Early-Bird Bookings!! ** Bookings received before Sunday 29th May 2016 will receive a Free S&E Beanie Hat! It’s a week that never disappoints but places are limited! We’ll see you there!